As we have seen, the war in heaven was not confined to heaven but affected the earth too. For some time it appears that Satan (the “accuser of our brethren, ” Rev. 12:10) was still able to stand before God’s throne and make accusations against God’s people. Job was one biblical character who suffered this indignity. Read Luke 10:1-21. What was the meaning of Christ’s words about Satan here? Before Jesus sent out the 70, He instructed them not to take any spare clothing or money (Luke 10:4) and to ask God’s blessing on their hosts (Luke 10:5) . He warned that they were like lambs walking among wolves (Luke 10:3) -a concern reflected in Revelation 12, where the dragon attempts to make war with God’s people. On their joyous return (Luke 10:17) the disciples reported that the demons were subject to them, and this must have brought Jesus great joy (Luke 10:21) . It is in this context that Jesus makes His statement about Satan falling like lightning from heaven. He warns the disciples that their joy must not be based on their success over demonic forces but rather on having their names written in heaven (Luke 10:20) . This reminder places human salvation firmly where it belongs-in the hands of our Savior. It is Jesus, not we, who has defeated the enemy. Jesus’ followers, however, are given the privilege of witnessing about the salvation Jesus has won. This episode in Luke 10:17-20 seems to link the work of witnessing that Jesus entrusts to His people with power over Satan in this great controversy. The work of witnessing erodes the power that Satan has over the people of this world and gives humankind opportunity to resume their original work of expanding the borders of God’s kingdom. Power over our adversary is only possible because of the victory Jesus won at the cross. Paul states that Jesus “disarmed principalities and powers” and triumphed over them(Col. 2:15, NKJV) . In Him, God’s people are triumphant. Satan’s demise is assured. “‘The ruler of this world will be cast out’”(John 12:31, NKJV) , never to malign God’s people again. We can surely rejoice that the battle is the Lord’s! “Rejoice, because your names are written in heaven.” Dwell on these words. What are they saying, and why is that such a great reason to rejoice? After reading the lesson ... it always has puzzled me ... Why do we not see the healings and demonic casting out in today's time? When you looked at the returning 70 ... that's all they could talk about. In the Bible I have noticed that at the beginning of an era there are wonders and then there are long periods of living by faith. These demonic castings and healing are highlighted mainly to emphasize Jesus as the Messiah... Isiah 61, Matt. 15:24. and because these things were prevalent among the children of Israel, the ones endowed with the spreading of the gospel. Jeff, those miracles were all done by faith, so what seems to be the obvious answer to your question? Also, that was in a day of harsh legalism, while grace was overlooked, and such miracles were evidences of grace. Today, (cheap) grace is the popular truth and the law has been disregarded and lost sight of. We have been given a set of wonderful "laws" by which all can be healed if they follow them in faith. However, there are still those miraculous healings and casting out of demons though rare. But faith is rare isn't it? The lesson for today talks more on us focusing on the victory of Christ on the cross for us than on we relying on our own individual abilities. We cant fight this battle on our own ,we need to rely on the divine strenght of the Holy Spirit if we must achieve victory in this battle against the prince of this world and his agent. We think it is important that they were sent out without personal supplies and script. It helped them to depend on Jesus' name and to attribute success to Him. Perhaps, we don't see today's miracles because our worldly trappings get in the way. Let me suggest this meaning to the words of Jesus in verse 18-20; Jesus seems to be saying something similar to: “Of course you had victory over devils, they are no match for the power of God, having fallen from heaven themselves. They are defeated already and are weaker than the humblest child of faith.”...or something like that. Yes, our rejoicing should be toward the Goodness of God who has given the Best Gift to save sinners from death, granting them eternal life through Christ. What are devils when God's word promises us that the devil will flee from us if we simply resist his temptations to sin against God. Satan is finished and knows it. His only effort is to keep US from knowing it too. Our unbelief gives Satan his only power over us. God was not in a hurry to evict Satan from Heaven without opportunity for redemption. In fact the Father still loves Satan to this day. However after a period of probation for all the angels to take a stand and express loyalty the deceiver had to go (Revelation 12:7-8). Otherwise faithful angels would be exposed to constant harassment and Heaven further corruption. When the dragon was cast down to the earth (Revelation 12:9) God was not simply off-loading Heaven’s problem to the earth. The rebels were not to be a constant thorn in the side of the human race. Mankind would have an opportunity to be tested in relation to loyalty (Genesis 2:16-17), a probation like was afforded the angels. The serpent’s access to mankind was apparently limited to the tree of knowledge of good and evil, which purpose was a test (Genesis 2:9). Had Adam and Eve proved their loyalty within the short time allotted it is likely Satan would have been evicted from the earth as he was from Heaven pending execution. 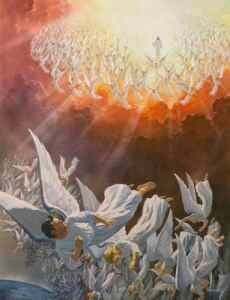 Passing the test and proving loyal and faithful mankind would eventually be as angels are and secure (Mark 12:25). Delayed it has been, but will be a reality someday soon for the redeemed (1 Corinthians 15:48-53). God has a special interest in the affairs of mankind and that is comforting. He gently reminds us when we go wrong and encourages us to do the right thing. His desire is to save us all, not willing that any should perish. He\'ll was made for the devil and his angels. May we choose eternal life as we contemplate the great sacrifice God has made to save us and accept it, willingly, before it is too late. Is this a pattern that will be repeated by Christ's remnant right before the close of probation? A hymn comes to my mind "Faith is the Victory" that overcomes the world. The Holy Spirit changes a person, He can change a person who is absolutely drenched in sin to someone who now sings praises to Jesus for rescuing him from certain death to life eternal. From a meaningless directionless and hopeless existence to an abundant life of joy and peace. Even, as is sometimes the case, in the face of adversity. Is not a renewed and changed heart the greatest miracle? The Jews sought a sign, king Herod wanted Jesus to perform a miracle as an entertainment, in Charismatic churches today, miracles and signs occur. Listen to what Paul has to say in 2 Thess.2:9-11; "The comming of the lawless one is according to the working of Satan, with all power, signs, and lying wonders, and with all unrighteous deception among those who perish, because THEY DID NOT RECEIVE THE LOVE OF THE TRUTH, that they might be saved. And for this reason God will send them strong delusion, that they should believe the lie" So you see the devil can use signs and miracles to deceive even the elect. So what should we do? Paul gives us this advice in Ephesians 6:14-18 ; "Stand therefore, having girded your waist with truth, having put on the breastplate of righteousness, and shod your feet with the preparation of the gospel of peace; above all taking the shield of faith with which you will be able to quench the fiery darts of the wicked one. And take the helmet of salvation, and the the sword of the Spirit, which is the word of God; praying always with all prayer and supplication in the Spirit, being watchful to this end with all perseverance and supplication for all the saints" Notice that the sword is equated with the word of God, it is this same sword that Jesus used to defeat the devil in the temptations in the wilderness, the sword is the thing that the devil fears the most and he goes to great lengths to get Christians to forget that they own one! We are involved in mortal combat here in the world, which Satan now controls by default, but the Lord has supplied us with weapons whereby we can crush the head of the serpent, (the Lord be praised)and rise victorious with Him who has overcome the world. Bless you all.